Almost a fortnight ago, in Hospital Blues, I wrote about my grandfather’s wounding at the Battle of Arras in August 1918, his subsequent recuperation back in England, and the desolating loss of his bride of one year, within days of his arriving home from the hospital. Among my aunt’s collection of family photos inherited from her father are a group of loose prints which include a series of eight snapshots taken on board a ship, some including soldiers in Canadian Expeditionary Force (CEF) uniforms. That they relate to my grandfather is clear since he appears in one of them, garbed in standard issue greatcoat and cap, similar to how he was in the image used in my previous article, standing in the snow, one hand in his pocket. The other soldier, also a sergent, is unidentified, but he looks vaguely familiar, so it may be that I've seen him previously in another of my grandfather's photos. It is clear that the remainder of the images form a series taken on the same journey from the purple batch number "5 9" stamped on the back of the prints. I have assumed for some time that they were taken by Leslie or a friend on the journey back across the Atlantic to Canada immediately prior to his demobilisation in early 1919. Upon returning to the Canadian Machine Gun Depot (CMGD) at Seaford in Sussex in late October, and with the war ending a couple of weeks later, duties must have been light. After another month there, Leslie was transferred to Kinmel Park, near Rhyl in North Wales – as shown by the final entry on his Active Service Form above - in advance of his repatriation to Canada. Marc Leroux, on his excellent Canadian Great War Project web site, described the conditions at Kinmel Park. For the 17,400 troops at Kinmel Park, conditions were far from ideal. The days were filled with exercises that they thought meaningless, medical examinations, route marches and military discipline and training. For them the war was over and they didn’t see the need. They were anxious to return to Canada, not just to their families, but they also realized that the first soldiers home would have the pick of the available jobs, and no one wanted to come home from the war and be unemployed. At Kinmel Park, there was the military bureaucracy to overcome. Troops awaiting transport had to fill in some 30 different forms with approximately 360 questions. The food they were fed was bad; it had been compared to “pigswill”. At night, the troops had access to “Tin Town” a nearby group of shops and pubs that had inflated their prices to take advantage of the, comparatively, well paid Canadian soldier. After a month of these rates, many soldiers were broke. Leslie was one of the fortunate ones. Not long after New Year he was one of a large contingent who entrained for Southampton, where they boarded the HMT Olympic, sister ship of the ill-fated Titanic, according to his service records, around the 9th to 11th January 1919. Originally launched in 1911 and described at the time as the "largest vessel in the world," the Olympic had been commandeered by the British Admiralty and extensively refitted at the Harland & Wolff shipyard in Belfast to carry 6000 troops. The image above shows the "Old Reliable" as she became known during her wartime service, displaying a "dazzle" paint scheme and with soldiers lining the railings . The two images above, from my grandfather's set, show what appears to be the foredeck of the ship with soldiers standing around and lined up at the railings. To the right, in the second photo, are some buildings which demonstrate that the ship is berthed in port somewhere. 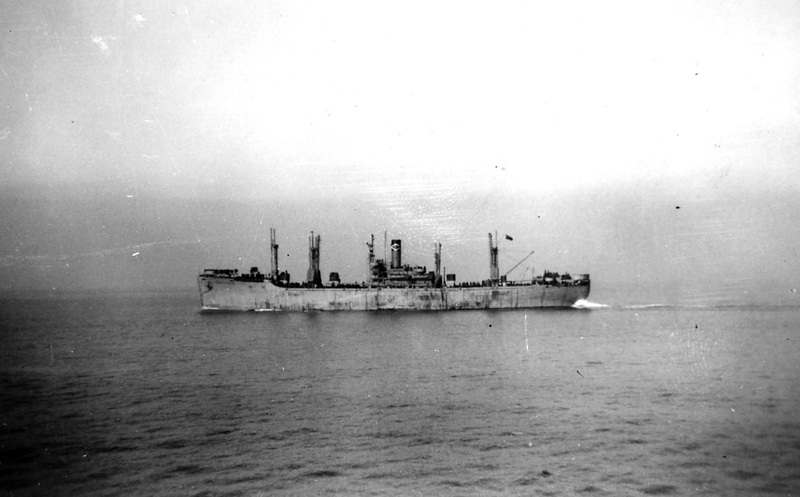 This image shows the foredeck of the Olympic, when berthed in New York a few years earlier, probably prior to her being pressed into service for the war effort. The similarities are striking. This view is from David Gray's comprehensive study of the Olympic's service during the war, well worth a read if just for the first-hand accounts of living conditions aboard . The still above is from a YouTube version of a clip from the Canadian film archive, Images of a Forgotten War, the original of which can be viewed here. About 45 seconds into the clip, the camera pans across the exact view of the Olympic's foredeck shown in Leslie's two photos, leaving me in no doubt that Leslie and friends were on the Olympic. In these two photos from my grandfather's trip, possibly taken in opposing directions, four funnels and some of the lifeboats can be seen. Following the disastrous sinking of her sister ship the Titanic in 1912, and the public outrage at there not being enough lifeboats for all of the passengers and crew, the Olympic had been extensively rebuilt and lifeboats were now available for all. Presumably the later 1914-1915 refit, which included the addition of "a 4.7-inch gun at the bow and a 3-inch gun at the stern" also supplemented the number of lifeboats on board. The large gun seen in the photo at the head of this article must be one of the six 6-inch guns which were installed as added protection in early 1917. In the background of this shot can be seen the spires of two churches. I wonder if it might be possible to identify these, and therefore decide whether the photographs were taken in Southampton docks, prior to their departure, or in Halifax, after their arrival. My insticts suggest the photos would most likely have been taken soon after their arrival on board, before the novelty of shipboard life had worn off. 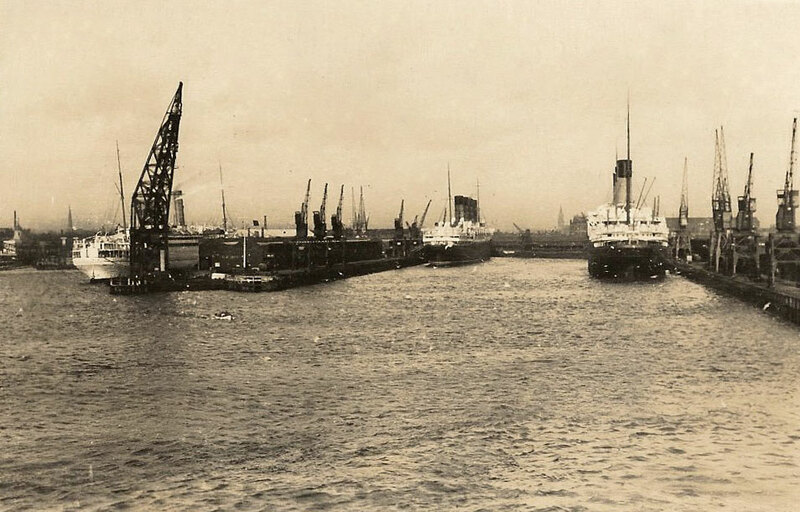 A postcard of the Olympic and Mauretania berthed in Southampton (here) has a similar church spire in the background, but I'm sure there were church spires in Halifax too. A further two views show more detail from the deck of the ship, including funnels, cranes, ventilation shafts, railings, lifeboats, benches, cables, pipes and plenty more to delight the naval enthusiast. This is my favourite photograph from the entire series - a real shipboard shot. Sadly, there are no more in which my grandfather or his friend can be identified. My guess is that this last photo was taken shortly after they left the Ocean Pier at Southampton Docks, as the Olympic was sailing down Southampton Water towards The Solent, and hence to the Channel, the North Atlantic, and Halifax. An expert in ships of the period might be able to identify the vessel being passed. Coincidentally, Larry Burgus posted a photograph of a very similar ship to this, one in which his father was sent to the war, as a Sepia Saturday article a couple of weeks ago. This plan of the HMT Olympic, overlaid with the positions and fields of view of my grandfather's photographs, was very kindly sent to me by Ralph Currell, who has an interest in the ship's wartime career. As might be imagined, due to wartime restrictions on photography there are many areas that are poorly documented, such as the armament, extra life rafts, and so forth. The images on your blog show a number of details that don't often appear in photographs ... they mostly pertain to the armament added to the ship during the war. If you look at my drawing you can see there are six guns (four forward and two on the after part of the ship). Your photos show an interesting stage where the forward guns have been removed (you can barely see one of the deck mountings in cllpayne21.jpg) but the after ones are still in place (as seen in cllpayne20.jpg). The shots of the lifeboats are also instructive. Because of the large numbers of troops carried, the "Olympic" had quite a few collapsible boats and rafts added to her ordinary civilian outfit, and these photos give some clues as to where they were stowed on deck. You'll notice the second photo (cllpayne21.jpg) is marked as "mirrored". That particular photo is reversed left-to-right -- presumably whoever originally made the print put the negative upside-down ... Most of the photos seem to have been made while the "Olympic" was in port, but cllpayne26.jpg shows the lifeboat davits swung outboard, suggesting the ship is underway. One curious thing I noticed about the unknown steamer (cllpayne27.jpg) is that the ship is "dressed" with flags running fore and aft via the masthead. I wonder if she was saluting the "Olympic's" arrival, or if it was due to some other festive occasion ... Regarding the photo of the smaller ship, it would probably be difficult to identify. It looks like a fairly typical cargo steamer, of which there would have been many in service. I can't make out any funnel markings that would identify the owners. The landscape in the background might give some clue as to the location though. Many thanks Ralph, for the interesting information, and the image, which certainly does help to imagine his time on board. It must have been pretty cramped, with all those additional passengers. Eight photographs taken aboard HMT Olympic, January 1919, Loose paper prints, approx. 64 x 42 mm, Collection of Barbara Ellison. Gray, David R. (2002) Carrying Canadian Troops: The Story of RMS Olympic as a First World War Troopship, in Canadian Military History, Volume 11, Number 1, Winter 2002, pp. 54-70.